Salads don’t have to be boring! 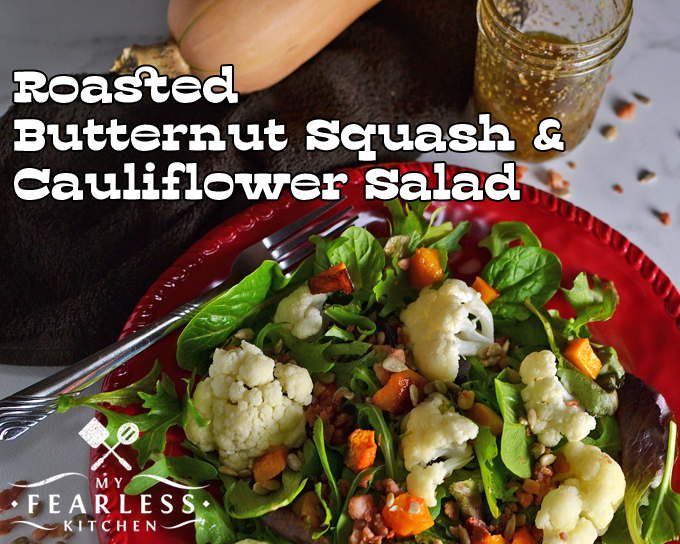 Get creative and try this Roasted Butternut Squash & Cauliflower Salad. Add in more toppings and it can be the main course! Winter is great – I love the cool temperatures of fall and the snowy weather in winter (when we actually get snow). And the comfort foods of cold weather… need I say more? But every once in a while, I really just need a salad. 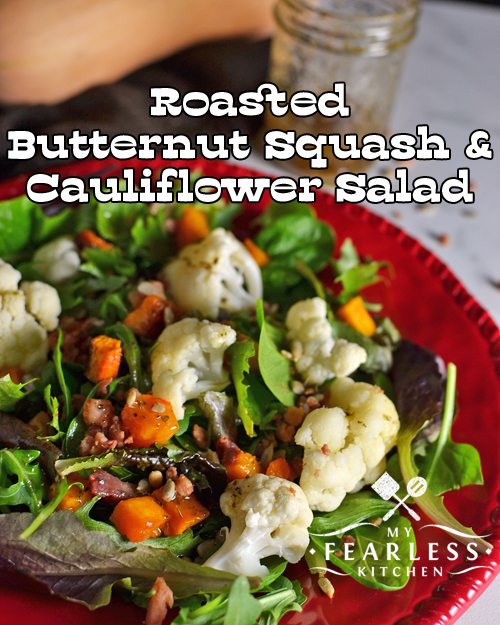 This Roasted Butternut Squash & Cauliflower Salad uses (somewhat) seasonal vegetables and flavors for a delicious treat! We grow butternut squash in our garden every summer. When we can stay ahead of the squash bugs, we usually have a really nice crop of butternut squash stored up for the winter. I love using it to make soup and to roast in the oven. I have thought for a long time about topping a salad with it, and it turned out great! I grabbed a bag of pre-cut cauliflower florets from our grocery store produce section. These are so easy, because all you have to do is poke some holes in the bag, toss them in the microwave, and you’re done! I like my cauliflower still a little crisp-tender (not too mushy), so I cook it a few minutes less than the instructions on the bag call for. Speaking of cold weather… have you ever wondered how animals outside stay warm? Check out this post to see how our beef cows stay warm outside in the winter. If you aren’t crazy about steamed cauliflower, you can also roast the cauliflower with your butternut squash. The cauliflower will cook a little faster than the squash, so keep your cauliflower pieces bigger than the butternut squash pieces (about double the size should work). I also made my own dressing for this salad. I used a half-pint-size mason jar, since I wasn’t making much dressing. I have some reusable plastic lids for mason jars I use for storing some things in jars, but I find that for oil-based dressings like this they tend to leak and get really messy. I prefer to use the two-piece canning lids for my dressings. If you want this salad to be the main course instead of a side dish, add some protein! A hard-boiled egg, a few slices of Basic Grilled Chicken, or even some Simple Marinated Steak would be the perfect addition. What is your favorite way to enjoy fresh vegetables in the cold months? Peel and seed the butternut squash. Chop the squash into bite-size pieces and place in a large bowl. Add salt, brown sugar, and olive oil to the squash. Toss to coat. Spread butternut squash in a single layer on a lipped baking pan. Roast the squash at 350 degrees for 30-40 minutes, stirring once, until squash is tender and edges start to brown. While the squash is cooking, prepare the dressing. In a half-pint-size mason jar, combine the Italian seasoning, brown sugar, apple cider vinegar, and olive oil. Let sit at room temperature until ready to use. If desired, cut cauliflower florets into smaller pieces. 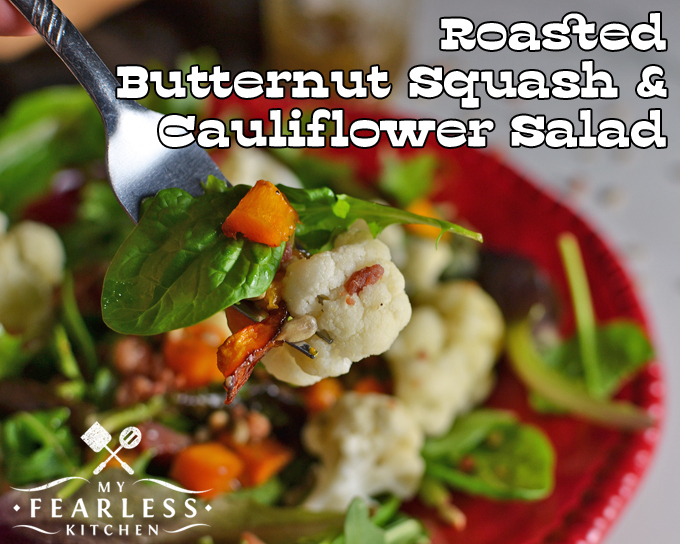 On 2 plates, layer salad greens, cooked cauliflower, and roasted butternut squash. Shake dressing well, and drizzle over salads. Discard any unused salad dressing. Refrigerate any unused vegetables.